When you have a big idea, you need a big canvas. If a poster or a wall doesn’t do the trick, you have to try the next best thing: a whole building. 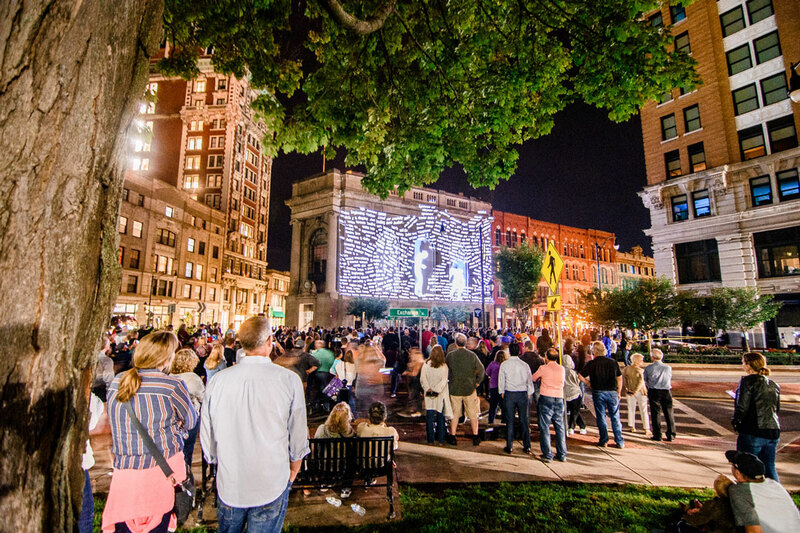 For the fourth consecutive year, the LUMA Projection Arts Festival transformed the historic cityscape of downtown Binghamton into moving, illuminating works of art. With state-of-the-art 3D animation and high-power projectors, artists from New York, Barcelona and Budapest designed projections that took the shape of the buildings’ facades and brought them to life. Cement columns and walls of brick, once anchored in their structural purpose, became bookends of stories too vast for anything smaller. LUMA reached milestones in 2018. 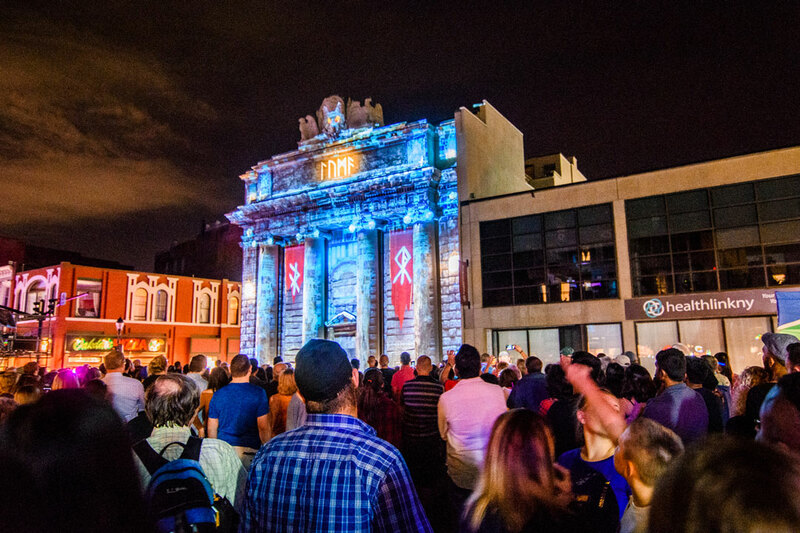 It expanded from a single day to a whole weekend of events, and hosted its largest projection to date. 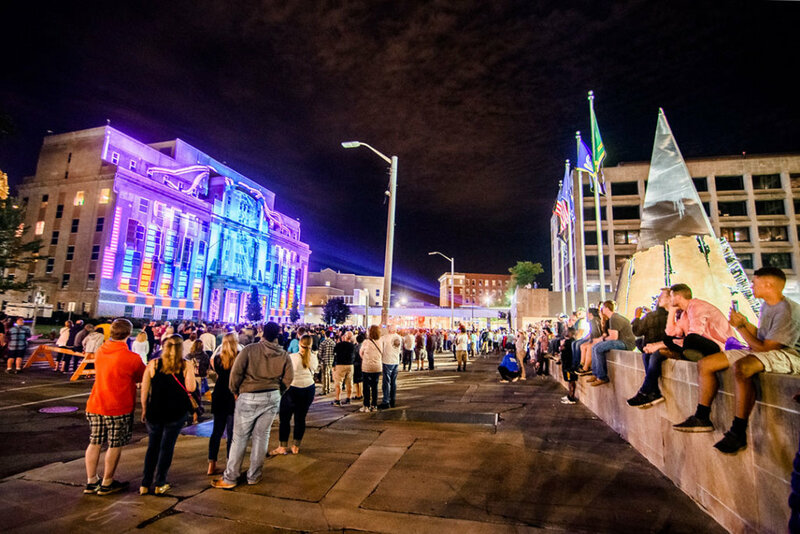 “The Neon Unconscious” by Budapest-based company Maxin10sity, scaled the seven-story George R Harvey Justice Building and required 17 of the 33 total projectors used in the festival. The projectors emitted 340,000 lumens, which equates the brightness of roughly six IMAX cinema projectors. While all of LUMA was otherwise free, “Transfiguracio,” a laser show held in the United Presbyterian Church, stood as the only ticketed event. The Binghamton Philharmonic Orchestra accompanied the lasers’ choreographed movements, which were designed by Onionlab, an audiovisual studio from Barcelona. They combined striking lighting design with powerful live music to create an ethereal, almost haunting experience. 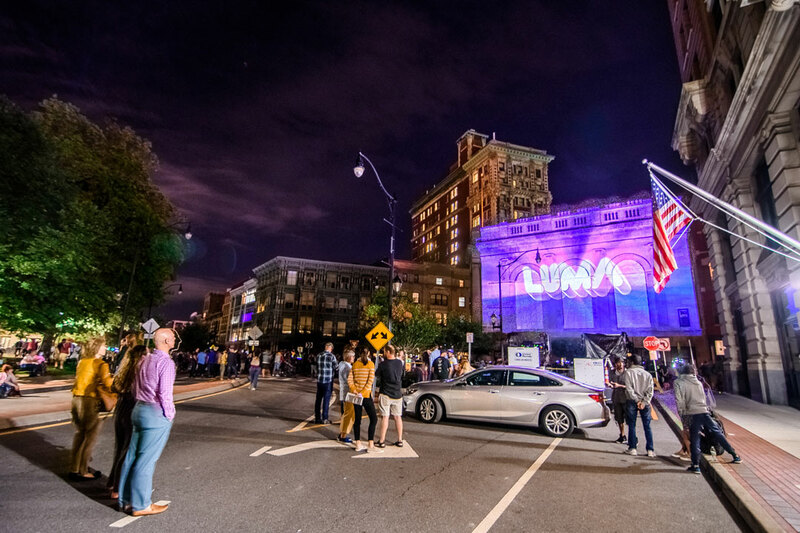 This year’s LUMA festival took on a new level of entertainment and community. Street vendors stretched throughout the city, giving people a reason to explore corners of Binghamton they might otherwise have passed by. The Atomic Tom’s building on State Street, home of the first LUMA festival in 2015, even hosted projections of virtual murals designed by local artists. It felt like a nod, a thank you, to those who had been there since the beginning. More than ever before, attendees could immerse themselves in storytelling beyond the projections. Live music, inflatable art exhibits, drag performances and dine-in-the-dark dinner specials filled the weekend with a contagious vitality that showed just what Binghamton has been up to lately. 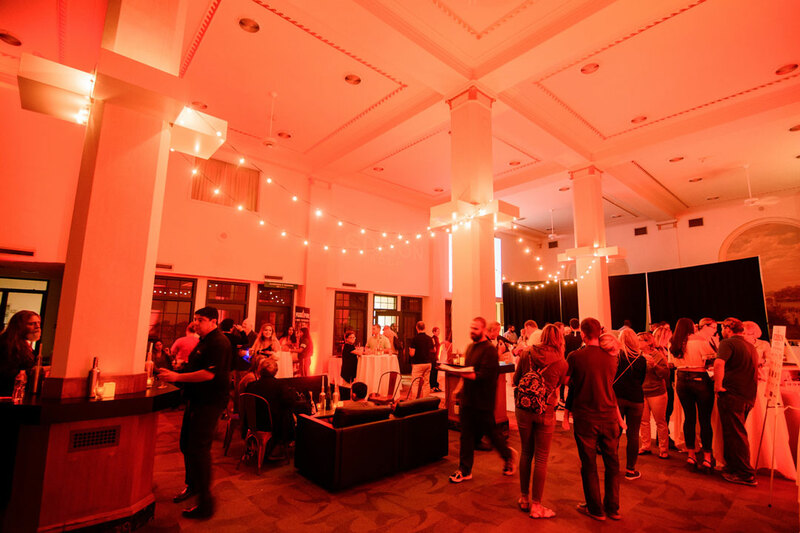 As a sponsor of the festival, Idea Kraft was tasked with organizing and hosting the VIP party. With an event as unique as LUMA, we knew that the party needed to do more than just reflect the brand; it needed to evoke a sense of wonder and sophistication that fit the festival’s rising global status. 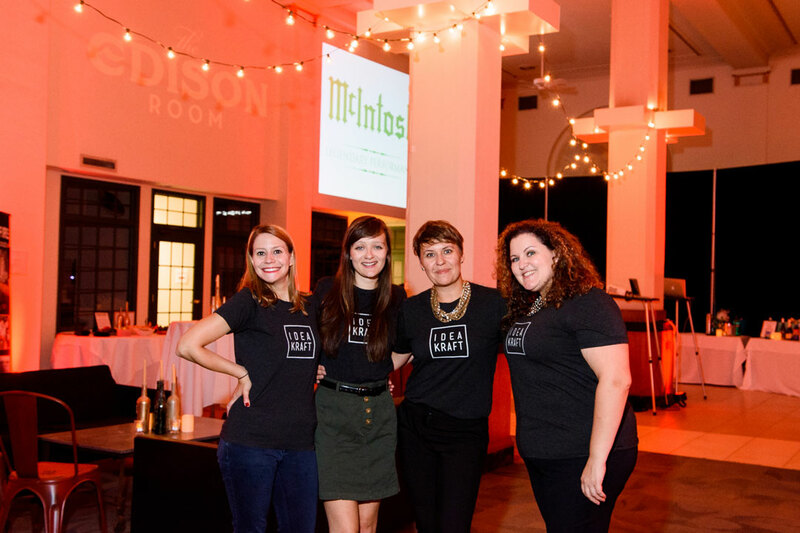 We incorporated LUMA’s atmosphere of innovation and light to our design, naming the event “The Edison Room.” The historic downtown M&T Bank gave us the perfect space to bring our graphic design off the invitations and into tangible application. The glowing red light installations and strings of industrial bulbs directly reflected our design, creating a moody, yet inviting experience. LUMA gives us the opportunity to see visions move from sketchpad to reality, and keeps us asking an important question: is this canvas big enough?